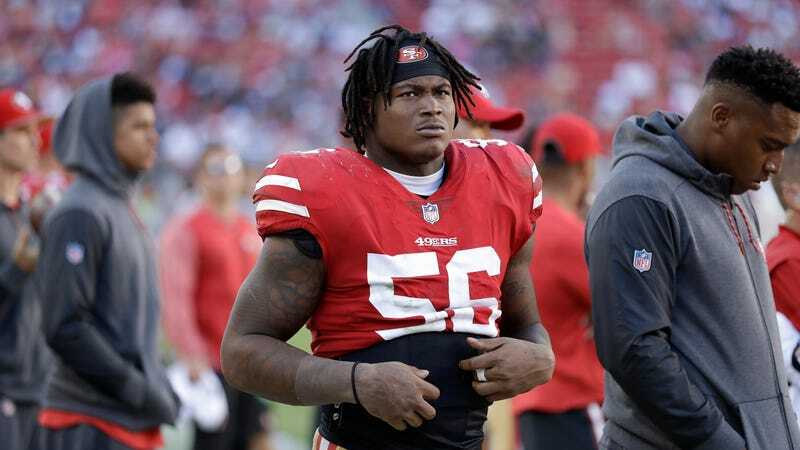 Reuben Foster of the San Francisco 49ers has been arrested on charges related to domestic violence, according to a report from the San Francisco Chronicle . Foster was booked Sunday at the Santa Clara County jail and held on $75,000 bail, according to the Santa Clara Sheriff’s Office. Officers were dispatched to a Los Gatos home for reports of a domestic disturbance. In the course of the police response, officers located what appeared to be an assault rifle inside the home. Foster started 10 games for the 49ers last season, won the NFL’s Defensive Rookie of the Month in November, and was named to the 2017 NFL All-Rookie Team. This is Foster’s second arrest in two months: He was arrested in January and charged with second-degree possession of marijuana in Alabama. Update (11:46 p.m. EST): The Los Gatos police department put out the following press release on Foster’s arrest. On February 11, 2018 at approximately 9:15 a.m. the Los Gatos Monte Sereno Police Department responded to a residence on Shannon Rd. in regards to a welfare check and possible disturbance call for service. Upon officers’ arrival, the victim and suspect were both contacted. As a result of the initial investigation, the suspect, identified as Reuben Foster, 23 years old, was arrested without incident by Los Gatos Monte Sereno Police Department on charges of 273.5 (a) PC- Domestic Violence, 422 PC- Threats, and 30605 PC- Possession of an Assault Weapon. Foster was transported and booked at the Santa Clara County Main Jail on the above charges. The incident is still under current investigation at this time.